Our Wedding limousine services are available to help you with your wedding limo rentals, the most important day in your life! Limousine Montreal Limos VIP can make this occasion as memorable as can be! We offer first-rate wedding limousine Montreal services can help transport you to and from the ceremony in style, elegance, and luxury. All our rented limos are decorated according to your style to make sure your pictures are as beautiful as your wedding day. We cater to any wedding needs: We offers Wedding limo services for your wedding day, rehearsals, wedding church, chapel, cathedral, civil hall, synagogue, photo time, ceremony, party, honeymoon, airport drop off and much more! Wedding Packages. We offer amazing limo rental wedding packages, our wedding limos include exceptional red carpet service, decorations, quality, luxury and best of the industry choices. Exceptional staff. Our staff and drivers are experts when it comes to planning this day for you, so let us take the worry off your shoulder and help you plan this day magical! With all our decoration choices, you will be sure to have the best pictures taken and the ride of your life looking like royalty. Accommodating Services. You have specific requirements for that day and we get that! Every Montreal limousine rental is special and is catered to our customer's need, that's why we make sure to have a one-on-one discussion with all our customers so that we deliver what they want, the way they want it. No task is too big or small for us. You ask it we deliver it. Big and Small Groups. Whether you are booking a limousine Montreal service for the bride and groom, or for a group of 20+ guests, we will find you the limo that suites all your groups size and needs. 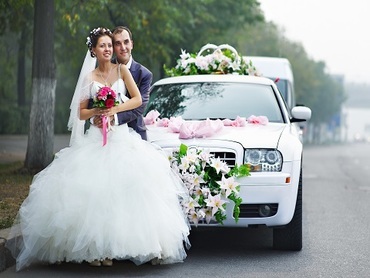 Transportation To and From our Airport Limo for your honeymoon. Rent one of our presidential limo to take you to and from any airport where you can travel to your honeymoon in an elegant, comfortable setting. We know how much effort is involved in planning a wedding and we want to make it as easy for you and effortless as possible. Let our professional and experienced staff help service you on that special day and make your limo dream complete. We are available to answer your questions so don't hesitate to call and book with us now for your wedding limousine ﻿services﻿. Limousine Montreal Limos VIP is available at any time of the day to discuss and plan the limousine for your special day. Rest assured that our services will exceed your expectations and fit your budget.